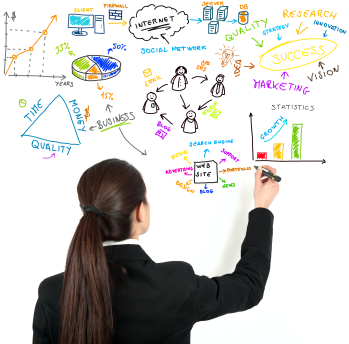 Our method of web marketing is focused on several primary areas that will help you do well. How do you get people to your website? The key is to rank well in search engines such as Google, Bing and Yahoo. Discovering what keywords people use when searching for a product or service you happen to sell is the first step. Building relevant pages on your site and backlinks from other sites can also help you rank better in the search results for those terms. Assisting those attempts with paid search, banners, ads, retargeting, email and social media is also an important part of web marketing and traffic generation. Your web site needs to be a sales and lead generation machine. Qualified guests come to sites looking for something. The website needs to give the user what they are looking for while sending them straight down a sales funnel that will result in an action, whether that’s filling out a form or completing an order. Once a visitor becomes a client the next step is keeping them. Following up with people by using e-mail marketing is a verified method of developing leads, as well as creating repeat business. Another powerful tool can be Social Media as it allows you to interact your potential customers and clients on a continual basis by using tools such as Twitter, Myspace, LinkedIn and Facebook. How can you tell if all of this is working? By using tools like Google Analytics or equivalent, as well as full featured, commercial methods to determine how many individuals are coming to the site, how they found you and what you did once they got there. Done efficiently this will help constantly improve your web site and judge the results of your active web marketing efforts. We can show you how to get the most out of these tools and also analyze your reports in our web marketing consulting.